As we said last week, Spain asked other European countries to help it put down rebellion among Spanish colonies in Latin America. Some of these colonies had overthrown their Spanish rulers and declared themselves independent. Britain wanted no part of the Spanish proposal. It was trading heavily with these new Latin American countries. Spanish or even French control of this area would destroy or limit this trade. So Britain proposed a joint statement with the United States to say that neither country wanted any of Spain's territory in the New World. Britain also wanted the United States to join in opposing the transfer of any of Spain's American territories to any other power in Europe. Now, Maurice Joyce and Harry Monroe continue the story. 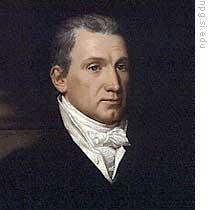 Most of President James Monroe's advisers urged him to accept the British offer. 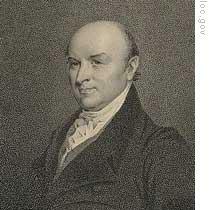 Secretary of State John Quincy Adams opposed it. He did not believe the United States should tie itself to any European power, even Britain. Monroe accepted the advice of his secretary of state. He included Adams' ideas in his message to Congress in December eighteen twenty-three. This part of the message became known as the Monroe Doctrine. The president said no European power should, in the future, try to establish a colony anywhere in the Americas. He said the political system of the European powers was very different from that of the Americas. Monroe said any attempt to extend this European system to any of the Americas would threaten the peace and safety of the United States. The president also said the United States had not interfered with the colonies of any European power in South America and would not do so in the future. But, said Monroe, a number of these former colonies had become independent countries. And the United States had recognized their independence. We would see it as an unfriendly act, he said, for any European power to try to oppress or control these new American countries in any way. At the same time, Monroe said, the United States never had -- and never would -- take part in any war among the European powers. This statement of Monroe's was only part of a presidential message to Congress. But it clearly stated one of the most important of America's foreign policies. The nation had continued to grow during Monroe's term as president. A number of new states were added to the union. Indiana, Mississippi, Illinois, and Alabama all became states before eighteen twenty. 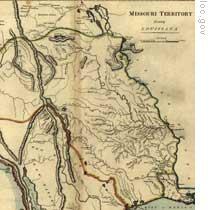 Louisiana had become the first state to be formed from part of the Louisiana territory that the United States bought from France. The rest of this great area was given the name of the Missouri Territory. By eighteen nineteen, there were enough people in part of the Missouri Territory for that part to become a state. It would be known as the state of Missouri. But Missouri could not become a state without the approval of Congress. And this approval was almost impossible to get. The problem was slavery. Slaves were not new in America. Spain had brought them to the West Indies hundreds of years before. In sixteen nineteen, a ship brought twenty African slaves to Jamestown, Virginia. These black men were sold to farmers. Over the years, the use of slaves spread to all the American colonies. There were many more slaves in the agricultural South than in the North. The farms in the North were smaller and needed less man-power. But in the South, farms were much larger, and needed many men. Slaves were the least expensive form of labor. Most of the northern states had passed laws before eighteen hundred freeing slaves. Even the southern states made it illegal to import more slaves from Africa. But those southerners who already owned slaves believed they were necessary, and they refused to free them. Slavery had been legal when France and Spain controlled the Louisiana territory. The United States did nothing to change this when it purchased the area. So slavery was permitted in the Missouri Territory at the time it asked for statehood. A New York congressman, James Tallmadge, offered an amendment to Missouri's request to become a state. Tallmadge proposed that no more slaves be brought into Missouri, and that the children of slaves already there be freed at the age of twenty-five. His proposal started a debate that lasted a year. Under the Constitution, three of every five slaves were included in the population count to decide membership in the House of Representatives. In the past, each time a slave state was admitted to the union, a free state also had been admitted. This kept a balance in Congress. William Pinkney of Maryland argued that states already in the union had joined without any conditions. If Congress, he declared, had the right to set conditions for new states, then these new states would not be equal to the old ones. The United States no longer would be a union of equal states. The debate was violent on both sides. Representative Howell Cobb of Georgia told Tallmadge: "You have started a fire. All the waters of the oceans cannot put it out. Only seas of blood can do so." The House of Representatives passed the Missouri bill with the Tallmadge amendment. It was rejected by the Senate. The people of Missouri would try again for statehood when the new Congress met in eighteen twenty. By this time, another free state was ready to enter the union. Maine -- with the permission of Massachusetts -- asked to become a separate state. Once again, a New York congressman tried to put a condition on statehood for Missouri. He offered an amendment that Missouri should agree never to permit any kind of slavery inside its borders. House Speaker Henry Clay said that as long as any kind of condition was put on Missouri, he could never permit Maine to become a state. Clay was not strong enough to prevent the House from approving statehood for Maine. This bill was sent to the Senate for its approval. The Senate, however, joined the Maine bill with the one for unlimited statehood for Missouri. Senators refused to separate the two. Finally, Senator Thomas of Illinois offered a compromise. He said Missouri should be admitted as a state permitting slavery. But he said no other state permitting slavery could be formed from the northern part of the Louisiana territory. The compromise was accepted. And Congress approved statehood both for Missouri and Maine. But they would not become states until President Monroe signed the bills. President Monroe had to make a difficult decision. He was a slave-holder. Many of his friends urged him to veto the bills, which would limit slavery in the Louisiana territory. And electors would soon be chosen for the next presidential election. Still, a decision had to be made. Our program was written by Frank Beardsley. The narrators were Maurice Joyce and Harry Monroe. To learn more about America's fifth president, go to www.unsv.com. You can download transcripts of our programs, along with MP3s and podcasts. Join us again next week for THE MAKING OF A NATION – an American history series in VOA Special English. the United States went a long way to add 50 stars to her stars and stripes flag. and it also took a long time to give up slavery in whole country. and electors would soon be chosen for the next presidential election.still,a decision had to be made.